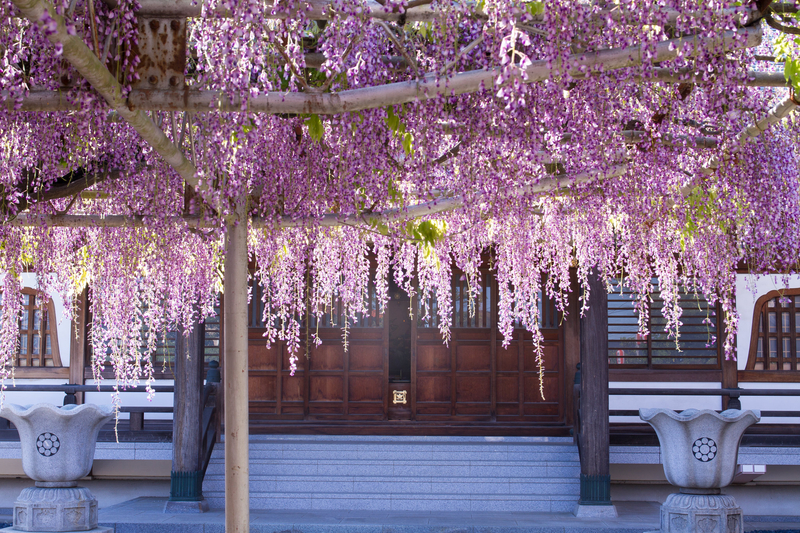 Japan’s cherry blossoms tend to steal the spotlight, but its wisteria vines are no less enchanting. As Travel + Leisure points out, there are a number of magical places around the country to see these flowering plants in all their glory. Contrary to popular belief, not all wisteria plants are purple. Different varieties display different colors, which may include pale blue, pink, white, and yellow petals. Some of these hues are on display at Japan’s Ashikaga Flower Park, which has a wisteria ceiling that visitors can walk beneath. It’s home to more than 350 wisteria trees, as well as the oldest known wisteria plant in Japan (it's more than 140 years old). 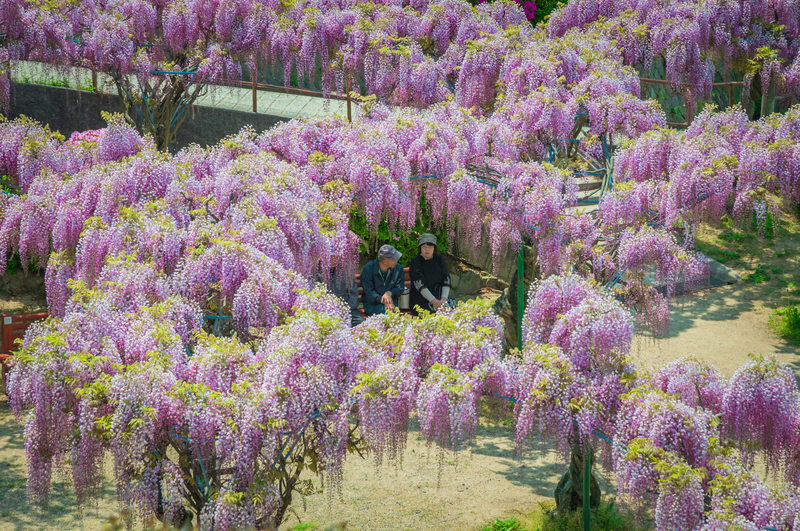 Located north of Tokyo in Tochigi Prefecture, the park is open year-round, but the wisteria begin to bloom from mid-April to mid-May, depending on the variety. In some cases, the fuji season (as it’s known in Japanese) may coincide with the blooming of the sakura (cherry blossoms). A wisteria festival runs from April 13 to May 19, but if you can’t make it to Japan, you can check out the website to see what the garden looks like. Traveling south, the Kawachi Wisteria Garden in Kitakyushu—the northermost city of Kyushu Island—is another must-see wisteria destination. 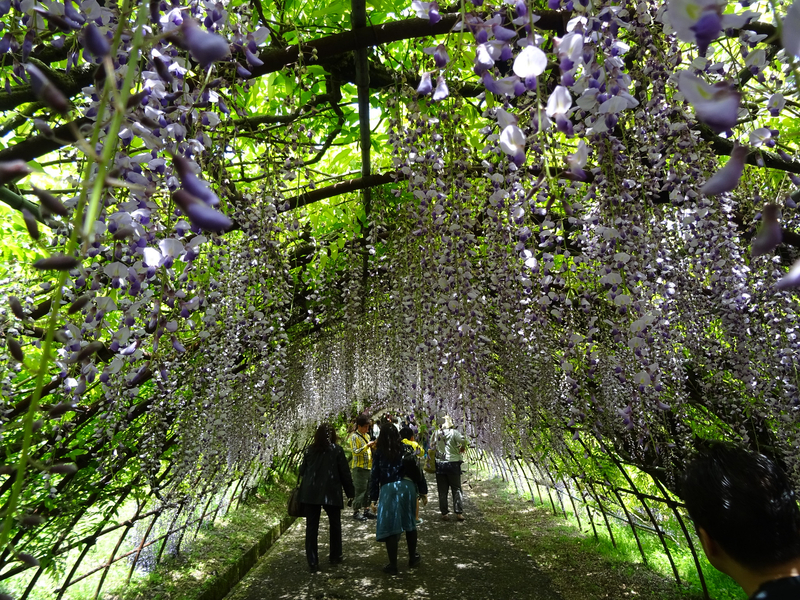 The garden’s two 330-foot wisteria tunnels boast 22 different varieties of the plant. 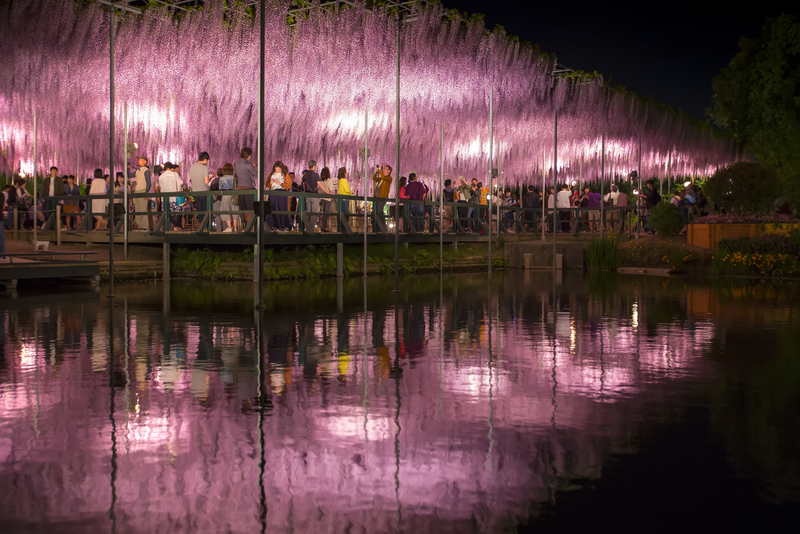 Other popular wisteria destinations throughout Japan include Tennogawa Park in Tsushima, Shirai Omachi Fuji Park in Asago, Tokyo’s Kameido Tenjin Shrine, Byodoin Temple in Kyoto Prefecture, and Koenji Temple in Ichikawa. The Kamitoba Sewage Treatment Plant in Kyoto is also an unexpectedly pleasant place to view the flowering trees. Check out some of the stunning wisteria photos below for some travel inspiration.